Each year Holy Name of Jesus high school teens can apply to go on a mission trip to the Nuestros Pequeños Hermanos Orphanage in Miacatlán, Mexico. This is an awesome experience that helps teens grow in their relationship with Jesus as they help children at the orphanage. Unfortunately, a 7.1-magnitude earthquake struck Mexico in September and damaged many buildings in Miacatlán. Because of the devastation, the HNOJ group was asked to travel to the NPH home in the Dominican Republic in 2018, and again in 2019. They will experience this new adventure Aug. 8-15. ﻿While at the house, we put on a VBS experience for 6-8 year-olds during the day and spend our afternoons and evenings giving attention to children who desperately need it. Each night we take some time to reflect on our day's activities and how we experienced God in the most vulnerable and marginalized. The deadline to apply for the 2019 mission trip has passed. Watch for details for 2020 around February at www.hnoj.org/nph-mission-trip . You can have an impact on the lives of orphaned children by helping us raise funds to support their needs. Below is a list of annual fundraisers and other needs. All funds raised directly benefit the NPH Orphanage. Each participant traveling to NPH brings a carry-on with their own clothes and two suitcases packed with donations and VBS supplies. The large suitcases are then left with the orphanage. Donations of large suitcases can be brought to Holy Name of Jesus anytime in June. One day this summer you will find the NPH trip group at the Holiday Gas Station on Rockford Road and Hwy 55 in Plymouth serving up hotdogs and hamburgers during the lunch hour. Stop by for lunch between 11 a.m.-1 p.m. and purchase some car wash booklets (they make great gifts!). The Holiday staff generously donates their time and food for the lunch and 100% of the proceeds are given to NPH. Donations of supplies can be brought to Holy Name of Jesus any time before July 15. Businesses and individuals are invited to sponsor a walking taco lunch. Download the form for more information. Families and individuals may sponsor an NPH child and donations are always welcome. To learn more about NPH, you can contact HNOJ parishioner Karen Richelsen at 612-730-7669 or karen.richelsen1@gmail.com or visit the NPH website. "The NPH mission trip to the home in Mexico is the highlight of my summer. I feel so blessed to be an adult chaperone on this trip and to represent the community of Holy Name down in Mexico. The children of this home show and reflect the beauty of our universal, Catholic faith and family. The HNOJ mission trip allows our teenagers to experience and participate in being the hands and feet of Jesus while serving for a week down there. 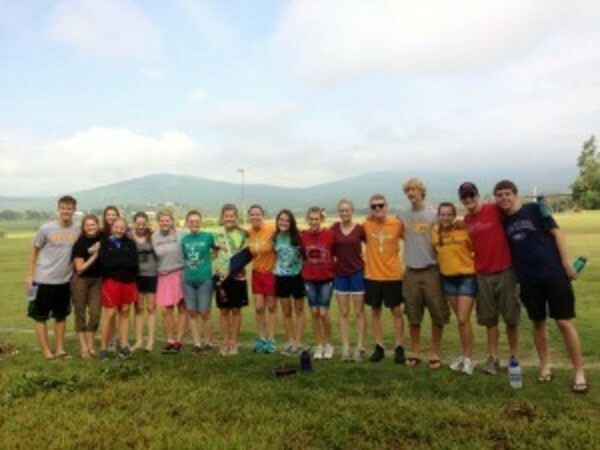 Every trip, I am in awe of the transformation of these young people as they become forever a part of the NPH family." "Seven years ago I signed up to travel to Nuestros Pequeños Hermanos (Mexico) with the HNOJ group. I knew very little about the home and had no idea what to expect. Fast forward seven years. I now sponsor two beautiful godchildren who live at NPH, and I am preparing for the biggest leap of faith in my life. I will be spending one year at NPH, volunteering as a teacher and caregiver. I had no idea that my first trip seven years ago would spark a passion in me and ultimately change my life. I highly encourage you to learn more about NPH and the beautiful children who live there. It may change your life as it changed mine." If you have questions about the NPH Mission trip, please contact Karen Richelsen at 612-730-7669 or karen.richelsen1@gmail.com.